In today&apos;s technological society, more and more professionals spend all day working on the computer. In order to ensure that everyone can maximize productivity, you need proper computer chairs. 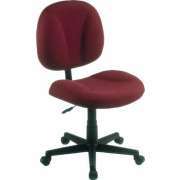 With the right office chairs, you can promote employee satisfaction. 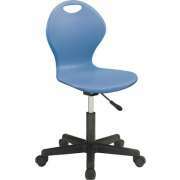 What kind of chairs are healthy for computer work? 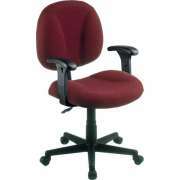 Our computer chairs are designed to help you accomplish your office tasks efficiently and comfortably. Attractive, contoured seats and adjustable positions ensure that these chairs provide excellent support and add style to your office. 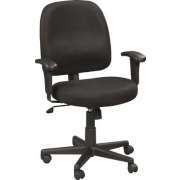 No matter what your budgetary and spacial needs are, Hertz Furniture can provide you with the optimal executive chair. 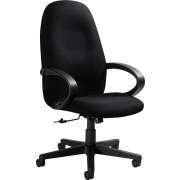 Why do I need a proper computer chair? When working at a desktop which is standing on an office desk, positioning is critical. For those professionals who work on computers for many hours, improper positioning can lead to serious pain and medical problems that will result in extended sick leave and may even require special procedures. Whether you are a school secretary or entry-level programmer in a hi-tech firm, it is of utmost importance to ensure that you are seated properly. What is the best position to work at a computer? To attain ideal ergonomic positioning, every part of the body needs to be properly aligned. The computer chair height should enable feet to rest flat on the floor. Wrists should be straight while typing, with arms resting naturally at the sides. Proper lower back support is essential so the spine&apos;s natural curve is accommodated. 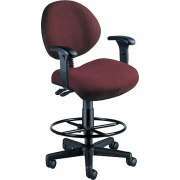 To get the body aligned properly, you need an ergonomic office chair. The multiple adjustments and contoured padding are designed to reinforce the body&apos;s correct positioning. An adjustable height, tilt-angle, back support and seat depth enable the computer chair to be positioned with the optimal settings for virtually anybody. 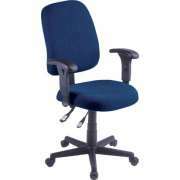 Because all people are built differently, it is essential that computer chairs are adjustable in a number of ways. 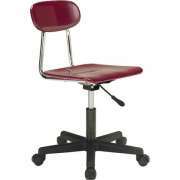 A swivel base is also important so executives don&apos;t have to strain or get up in order to reach essential items. 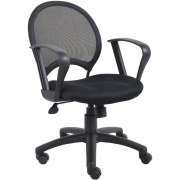 What kind of office chair is best? 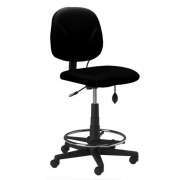 The material of an office chair impacts both the comfort of the person seated in it and the overall visual makeup of the work space. 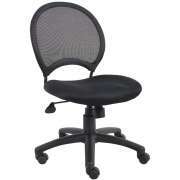 Mesh office chairs maintain a healthy airflow which is especially helpful in hotter climates. This material also complements a modern design, creating a light and airy feel that is appropriate for a startup or school. Nothing can replace the classic elegance of leather. While other materials attempt to project a similar appearance, the unique elegance of a leather office chair is unmatchable. This luxurious material projects an air of authority and competence, especially when placed behind the right imposing office desk. 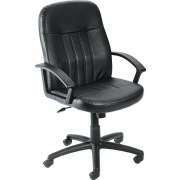 When a professional is seated in an elegant leather swivel chair, no one will doubt the company&apos;s success. 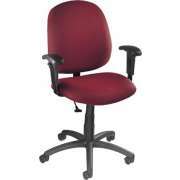 What kind of office chair fits a larger person? People come in all shapes and sizes, and not everyone can fit well in the average computer chair. 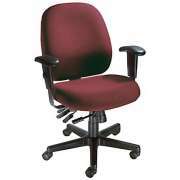 Big and tall office chairs are designed to ensure that professionals with larger builds can sit properly at the office. although office chairs are generally designed to support the average person, larger individuals might exceed the weight capacity of these models. You don&apos;t want to take chances. If a chair breaks because too much weight is applied to it, this will embarrass employees and cost your company money. 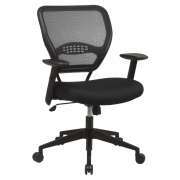 What should I think about when choosing a computer chair? No matter which computer chair you choose, you should make sure to pay attention to the smaller details as well. Padding thickness will determine how much support a chair can give. Upholstery material and color affects the chair&apos;s appearance and style. Computer chairs come with either high-, low- or mid-back arrangements so you have to choose which one is optimal. Having the right kinds of chairs is very important everywhere, but schools in particular need to make sure that their students have appropriate seating. With all of the recent excitement about revolutionizing STEM education and teaching programming in schools, computer use is only increasing. 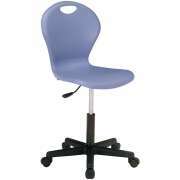 The more time students spend working in front of a PC, the more important it is for them to have appropriate computer chairs. If our schools are going to succeed at implementing new ideas that rely on technology, such as blended learning, making sure we have the appropriate computer furniture is imperative. 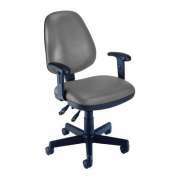 Your computer chair just might be the single most important component in determining how comfortable you are throughout the workday. 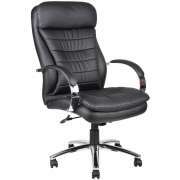 Our executive chairs come from reliable manufacturers including Boss, Mayline, Global and OFM. 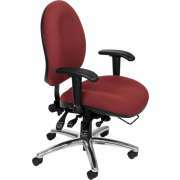 With a supportive office chair, professionals can enjoy hours of uninterrupted productivity. When employees are happy and healthy, the whole company will run better and therefore experience greater success.